Powerful documentary about living under the Mugabe Regime Plays for One Night Only. A powerful documentary depicting the encounter between the Zimbabwean president Robert Mugabe‘s land reforms’ impact on one white Zimbabwean family, Mugabe & the White African (2009), will be screened at Splendid Cinema on the 3rd of March. This will mark only the second ever screening of this film in Worcester – a film which was edited here in the city by local editor, Tim Lovell. Mugabe and the White African offers an intimate portrait of the family of Mike Campbell, one of the few white farmers left since the land seizure programme introduced in 2000. Campbell’s farm is the home for his own family and 500 farm workers and their relatives. The impact of these reforms would devastate the local economy. The documentary depicts not only the Campbell family’s defiance against the Mugabe regime, but also their courage by charging the government with racism and violations of their basic human rights. Filmmakers Lucy Bailey and Andrew Thompson’s tight focus on the Campbell family and the horrors they experience whilst trying to challenge the political injustice, makes a powerful statement, as well as adding complexity to what is normally reported regarding the region. Nominated for a BAFTA award for Outstanding Debut by a British Writer, Director or Producer in 2010, the film has won several other awards including the British Independent Film Award in the category of the Best Documentary in 2009. Tim Lovell, the editor of the Mugabe and the White African, will be in attendance to do a Q&A after the film. In addition, Worcester’s only independent cinema will also be screening Shalom Kabul, a short film by Jack Jewers, before the feature as part of the Splendid Cinema’s initiative supporting local filmmakers. 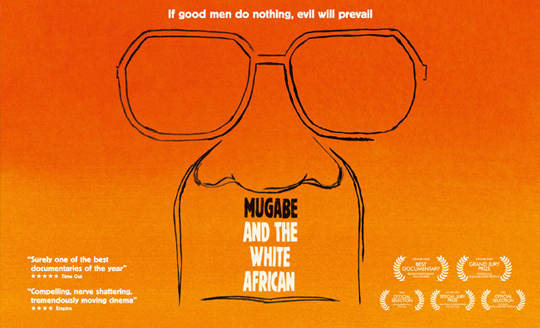 Mugabe & the White African (UK, 2009, Lucy Bailey & Andrew Thompson) 90 min. 12 Cert. The next film to be screened at Splendid Cinema is Mother (2009), the latest film from South Korean director Joon-ho Bong, a film which redefines the cliché about what a mother would do for her children. The film centres on a devoted mother (Hye-ja Kim) who will stop at nothing to protect her mentally challenged son (Bin Won) from a murder charge she’s positive he is not responsible for. And we mean she will stop at nothing! Director Bong hit the international stage five or six years ago with the much acclaimed monster movie The Host (2006). He‘s since finished princple photography on his first Hollywood film, Shadowpiercer, which is due out later this year. The film is notable for its unexpected narrative twists and the director’s exceptional cinematic vision. It questions the nature of motherhood, specifically, how far would a woman go in order to defend her child, making Mother a thought provoking, emotionally resonant social satire, where director’s masterly combined plot-driven realism and atmospheric cinematography make this film a remarkable two-hours. At the centre of Bong‘s film is the remarkable Hye-ja Kim, as the titular mother, who has earned several international critics‘ awards for her performance. The film too earned several awards, both in Asia and in the West, including the Best Film nod at the Blue Dragon awards (South Korea‘s Oscars). In addition, Worcester’s only independent cinema will also be screening Eventide, a short film by Brian Harley, before Mother as part of the Splendid Cinema’s initiative supporting local filmmakers while also celebrating the best in World Cinema. For more information on any of the independent cinema’s screenings, please contact Mikel Koven at splendidcinema@live.co.uk, or follow us on Twitter @splendidcinema or our blog splendidcinema.wordpress.com. Mother (South Korea, 2009, Joon-ho Bong) 128 min. 15 Cert.